Hanoi stopover tours are short. However, the tours have 2 best attractions of Vietnam vacation like stunning Halong Bay and peaceful, beautiful Tam Coc known as Halong Bay on land. Join Hanoi tours, the best of Vietnam tours. Limited offers for amazing Hanoi tour. You will be picked up at the airport for transfer to your hotel. Free at leisure. 8:30 Start your Hanoi tour with the museum of ethnology where the daily used objects and costume of 54 Vietnamese groups are displayed. And then, Ho Chi Minh Mausoleum, his House on Stilts and One Pillar Pagoda. Visit the Temple of Literature(founded in 1070AD, the first university in Vientam) Then take a cycling tour around old quarters, seeing the real life of local people. Enjoy waterpuppet show. Amazing experience on Vietnam vacations. 8:30 Enjoy taking photoes along the peaceful countryside to Hoa Luu, the ancient capital of Vietnam. On arrival, see the Dinh and Le temples hidden in a very large area of limestone mountains. Then, take a seat on a sampan to Visit three cave in stunning nature along charming Ngo Dong river. Tamcoc is one of the best destinations for Vietnam tours. After lunch in a local restaurant, visit Bich Dong pagoda with three levels from the foot to the head of a forested mountain. Overnight in Ninh Binh. 8:30 depart to Halong city. 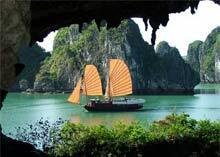 Upon arrival, join Halong bay cruise to discover many of 3000 forested limestone islands. Discover a floating fishing village and Thien Cung cave, amazing stop during Halong bay tour. Have lunch while your junk is cruising Halong bay through beautiful sceney, the King palace of all Vietnam holiday packages. Overnight in Halong city. Pick up at your hotel. Transfer to airport. Your Hanoi tour ends. Tour Hanoi for unforgettable Vietnam holidays. If you are not satisfied with Hanoi tours, get your money back.